Year-on-year (y/y) growth in monetary institutions’ outstanding mortgage balances slowed down further to 3,6% y/y in October 2009 (4,8% y/y in September), which was the lowest growth on record. On a month-on-month basis, the outstanding balance on mortgage loans was up by 0,3% in October, after rising by 0,2% in September. Outstanding mortgage balances in respect of the household sector were up by 3% y/y in October, down further from 3,9% y/y in September. Month-on-month growth of 0,2% was recorded in October (0,1% in September). 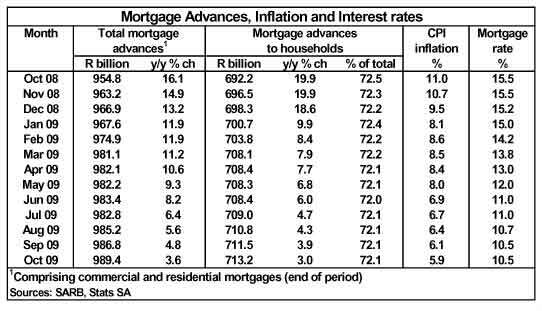 At R713,2 billion in October, the share of outstanding household mortgage balances in total credit extension to the household sector remained stable at a level of 70%. Total credit extended to the household sector, which includes mortgage advances, tapered off to 2,3% y/y in October 2009, from 3,1% y/y in September. On a monthly basis, the growth rate remained stable at 0,1% in October from September. Housing market conditions have improved somewhat in the past two months with nominal year-on-year price growth turning positive again after being in negative territory since late 2008. This is according to Absa’s latest House Price Index calculations. Property transaction volumes also appeared to have bottomed and are gradually rising to higher levels. These trends, driven by lower interest rates and less tight lending conditions, are expected to cause the year-on-year growth in mortgage advances to reach a lower turning point in the near term. Despite the lower interest rates and a slowly improving economy, the household sector is expected to still experience some financial strain into the first half of 2010 on the back relatively high levels of debt and income growth under pressure in the wake of major job losses. 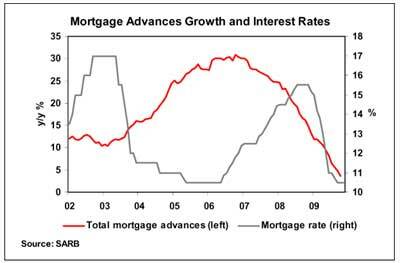 As a result, year-on-year growth in household mortgage advances may only improve gradually during the course of 2010 and remain in single digits throughout the year.